I’m a little surprised that I was never deeply into Futurama when it was actually on the air and they were making new episodes. I didn’t hate the show, I just wasn’t really excited to see it for one reason or another. It’s odd because the crew who creates it has quite a few overlaps with The Simpsons, and my love of that show has been made quite plain here in the past. When I discovered that Futurama’s first three seasons were available on NetFlix I was eager to stick them at the front of my queue, and I did just that. I watched them in a matter of weeks, and now I’m a big fan. I should’ve known that satire and sci-fi would be like the peanut-butter-in-my-chocolate of television. Fox didn’t agree with that assessment, unfortunately, but no one’s ever sure what those guys are thinking. Anyhow, I wanted to share a couple clips (Fair use! Fair use!) from one of the episodes in season three in the hopes that you’ll go and check it out. When I first watched this episode, I was shocked to find that Beck plays a rather large role in it. He’s one of my favorite musicians, and he does quite a lot more than a cameo. Those of you who are fans of Beck’s music will appreciate these jokes much, much more than those who haven’t heard it or aren’t very familiar with it. The thing that really impressed me about this episode was how tightly it was connected to Beck’s work, instead of just being generic music jokes or generic rock star jokes. 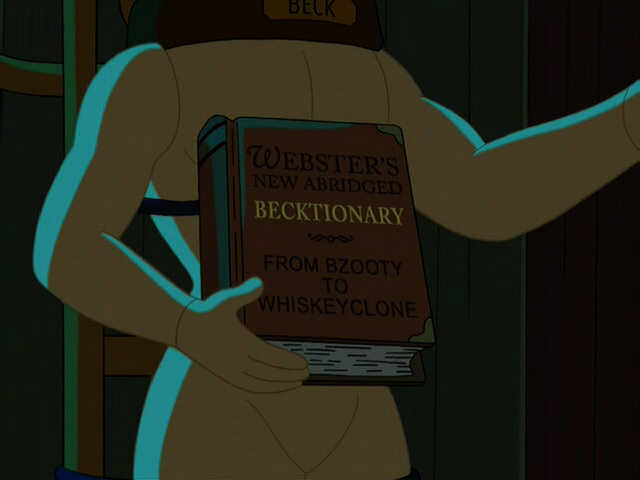 So without further ado, I present Bender’s introduction to Beck, and the Becktionary.